This is a perfect cheesecake for pure vegetarians & others as well. So everybody love this. Spread and press the sponge cake into the base of a 175 mm. (7") loose bottomed cake tin. Soak the sponge cake layer with the sugar syrup and keep aside. Keep 4 tbsp milk aside and bring the remaining milk to boil in a deep pan. When the milk starts boiling, remove from the flame, add the lemon juice and wait for 2 minutes. Stir once and again wait for 2 minutes or till the milk is completely curdled. Strain it with the help of a strainer and squeeze out all the excess water from the paneer. Combine the prepared paneer, 4 tbsp milk (kept aside), sugar and fresh cream and blend in a mixer to a smooth paste. Transfer the paste into a bowl, add the cream cheese and mix well. Strain the prepared mixture with the help of a sieve and keep aside. 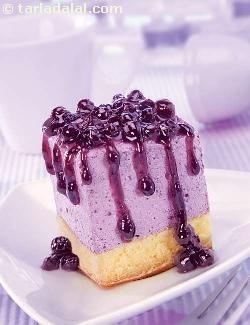 Combine the prepared basic cheesecake mixture, blueberry crush and lemon juice in a bowl and mix well. Add the whipped cream and fold gently. Pour this mixture evenly over the prepared sponge cake base and spread it evenly using a palate knife. Refrigerate for 1 hour or till the cheesecake sets. Demould the cheesecake and cut into 6 equal wedges. Pour 2 tbsp of the blueberry crush on each wedge and serve chilled. To make 2 tbsp of sugar syrup, combine 2 tbsp of sugar with ½ tbsp of water in a small saucepan and allow to simmer on a slow flame till the sugar thickens. For parties, you can set the cheesecake into individual moulds of your choice.